Many years ago that I read the Lensman series by Doc E. E. Smith, the precursor to all modern space opera that came after it. Even at the time I read it the technology was dated as these books were written in the 40s and 50s (and even I had no read them when they were first published), but that all did not matter to me at all. These were just great stories. My first read was in a German translation and I am rather certain that I read at least a few of the books in English after I came to the US of A. For a long time now I wanted to read them again but these books are hard to come by – most of them were out of print and I believe still are – you can’t really find them on Amazon in form of inexpensive paperbacks, maybe as bound collectors items but not for an amount that I was willing to spend. 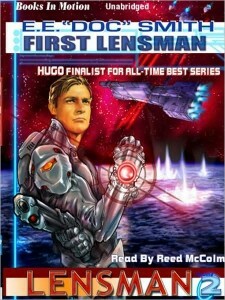 As I was approaching the last few pages I needed the next one – First Lensman. Quite a bit of googling later I finally hit the mother-lode at Arthur’s Bookshelp. He had them all and as I was at it, I also got the Skylark series for the time when I’m done with the Lensmen. That could be a few years at the slow pace I am going. This entry was posted in Art, Culture, History, Technology and tagged e e doc smith, first lensman, galactic patrol, lensman series, skylark series, space opera on April 20, 2013 by Merlin Silk.